Met pursuant to adjournment. Elder Carter read the 3rd chapter of Malachi. Commented on the whole chapter but confined his remarks more particularly to the tenth 16_17_18 verses followed by Blankenship & J Jones when the brethren & sisters presented seemed to have brought all their likes into the store house & they solemnly opened the windows of heaven & poured out such a blessing that our souls were filled wo overflowing & to magnify the name of the Lord when our minds seems to run together like drops of water that could not be separated & were made to rejoice in the prophet of heaven & a glorious immortality & to pray God to have mercy upon sinners. Adjourned to meet at the school house at candle light. Met pursuant to adjournment preaching by Carter followed by Blankenship. Adjourned to candlelight. Met pursuant to adjournment preaching by Blankenship followed by Carter when Natalie Harris & Amanda Wallace were received for Baptism. Their baptism deferred. Adjourned to meet at Brother Jones’ at 11 o’clock. Met pursuant to adjournment preaching by Brother Stinson a Congressionalist Minister of Ohio from the 6ver of the 85th psalms wit thou not revive us again that thy people may rejoice in thee when brethren Blankenship, Carter, Jones each gave a short exhortation & prayer when the lord truly did revive us again & we had a season of rejoicing & each felt that it was good to wait upon food & to sit together in heavenly places in Christ Jesus, adjourned to candlelight at the school house. Met pursuant to adjournment preaching by Blankenship followed by Carter when deep solemnity prevailed the entire congregation. Adjourned to 11o’clock tomorrow. Saturday morning 10th met pursuant to adjournment preaching by Hyram Ashmore a Cumberland Presbyterian followed by Blankenship. Adjourned to candle light. Met pursuant to adjournment preaching by Blankenship followed by carter. Adjourned to 10 o’clock Sabbath. Sunday morning 11th met according adjournment. Spent one hour in prayer & exhortations. Preaching by Carter followed by Blankenship when Eveline Core was received for baptism & immediately repaired to the water the ice being previously cut away where five of the candidates were immersed by Elder Carter. Adjourned to candle light. Met pursuant to adjournment preaching by H Ashmore followed by Blankenship exhortation by Carter & Stinson some same forward for prayers took a collection when it was announced that the meeting must come to a close when Brother Carter made a short exhortation to sinners declaring that they had been faithfully warned of their danger when all joined in singing ‘Jerusalem My Happy Home’ and gave the pasting hand prayer offered by Brother Stinson. Dismissed in peace. Joseph Jones Clerk. Walkers Point Church met Saturday June 9th 1855 Preaching by Elder B Harris then organized for business by appointing Brother Harris Mod 1st Resolved whereas Henry Wiley has declared non fellowship with us, by writing with the Campbellites that we withdraw the hand of fellowship from him & that he be no more of us. 2nd by request we release Elder A C Blankenship from the pastoral care of this church. 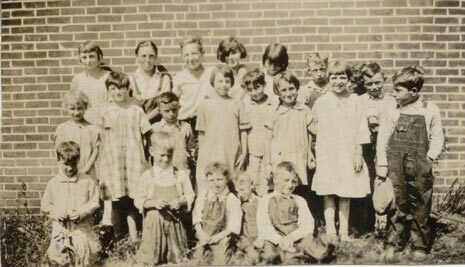 2nd A request was made by Brethren & Sisters residing near the Morehead School house in Vermillion County Illinois for help to organise them into an independent church. Their request granted & the following brethren to be our delegation – S Stearns, J Littler, John Littler Senior, Samuel Fortman & J Jones adjourned to 11 tomorrows.